As a senior project, three Wilkes students repaired a classic pinball machine by installing modern computer technology. 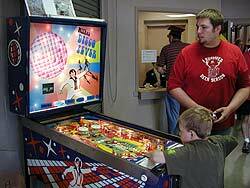 They presented it at the Allentown Pinball Wizards Convention, the largest tradeshow on the east coast, May 5-7, 2006. Chris Issler, of Newton, N.J., and Joe Price, of Exeter, presented their senior project -- a pinball machine entirely under computer control -- at the convention. A third group member, Ryan Pecukonis, of West Wyoming, also worked on the project but was unable to attend. “Pinball enthusiasts really enjoyed peering under the hood,” said Dr. M. Anthony Kapolka, associate professor of mathematics/computer science. On Saturday, the computer-emulated machine was featured at the show entrance, where several thousand people got to see it. It was available for free-play during much of the show. “Pinball machines have lost popularity since games like Playstation and X-box. Also, their size, weight and expense (a new machine costs about $4,500) make them less appealing to gamers,” said Issler. 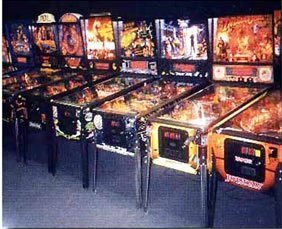 There is still a large group of people that enjoy playing and collecting pinball machines, however. Places like bars and arcades use pinball machines since they are more durable than an X-box controller. The students’ machine plays exactly like the original Disco Fever, the game it was modeled after, except it is run by a computer, not the original circuit boards. The original “back glass,” the vertical glass that faces the player, was redesigned by Price to have a screen for displaying scores and the Wilkes name. There is currently one other working computer-emulated pinball machine using the same hardware and software used by the students. It was built by the same person who built the hardware, but Issler and Price are the first to buy his hardware and replicate the process. The machine is now being kept in the math/computer science club room, until it can be moved for display to the Henry Student Center. and click on used pinball machines. 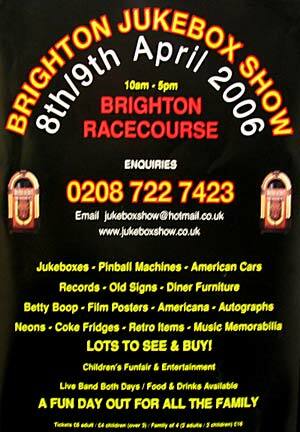 Brighton Jukebox Show held at Brighton Racecourse on England's south coast. NEW YORK, May 10 (Reuters) - Video game maker Atari Inc. (ATAR.O: Quote, Profile, Research) said on Wednesday it raised $13 million through the sale of the intellectual property rights to two games, TimeShift and Stuntman. Atari said the sale is in line with its plan to divest assets which it feels are not core to its business. Hungarian games company A8 Audio, best known for their Music Line series of digital jukeboxes, has brought out this new video pinball game - Goal Pinball. 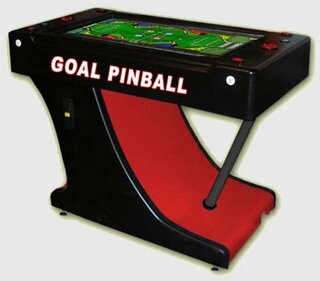 While there are other video pinball systems out there such as TAB's Virtual Pinball and Global VR's Ultracade pinball, Goal Pinball is unique in offering both single person play and head-to-head play with players standing at each end of the game. Based around a horizontally-mounted 42 inch screen, Goal Pinball features a number of different virtual pinball games designed to appeal to a range of players. The side mounted flipper buttons are supplemented by two thumb operated buttons to provide a virtual nudge to the game (and eventually tilt it). Although originally designed to use a 42" plasma display, the game is also available with an LCD screen of the same size, which is supposed to provide better resolution and reliability. Puffy pink and blue stuffed animals sit towered in a corner of the "Family Fun World" arcade in Lake George -- a sure sign the busy summer season is about to start. Those giant plush toys, redeemable with 2,200 bright pink tickets (now that's a lot of Skee Ball), are also big reasons why arcades like Fun World stay busy.According to Fun World owner and Lake George village Mayor Robert Blais, competition from home video gaming systems would have dimmed his pinball machines for good by now, if not for those toys. "When someone comes into a family entertainment center today, they're looking to leave with something for their money," said Blais, who's been in the arcade business for the past 35 years. Redeemable prizes are the main edge arcades have over home systems like Sony Playstation and X-Box 360, Blais said.But keeping that edge comes with a price.Around 25 years ago, if Fun World took in $100,000, Blais would use about $10,000 of that for prizes and giveaways. These days, he'd spend more like $35,000 for the prizes.That's also because prizes are becoming more and more sophisticated. Sure, one ticket will get you a pixie stick full of colored sugar, but if you put in your time and accumulate 10,000 -- that could score you an iPod.Besides, Blais has found the games that offer instant rewards -- either point tickets or actual prizes -- are the most popular. "In our arcade, you'll find that 66 percent of the income will be from games that give out a prize," Blais said. More than half of the games in the arcade give out prizes or tickets.Blais shies away from calling Fun World an "arcade." He opts for "family entertainment center," because unlike mall arcades where lots of teenagers congregate, his establishment stays away from violent shoot-'em-up games and opts for a wider range of games that appeal to young and old.But Anthony Cuthrell, manager of the video arcade "Tilt" in Queensbury's Aviation Mall, said his customers also run the gamut, from young kids to parents.Cuthrell believes it's the atmosphere that gives arcades like Tilt an edge over home video gaming systems. "It's mostly because you're around more people," Cuthrell said. "Like with the dance games, you like to show off your skills. People come to watch that." And like Fun World in Lake George, prize giveaways are Tilt's bread and butter. A listing of "redemption prizes" is currently under construction on the arcade's Web site, www.tilt.com. Ironically, some of the prizes patrons can redeem with Tilt tickets include a Nintendo Game Boy and an X-Box 360, according to the Web site.But even though Nintendos can't spit out prizes every time you master another level of Donkey Kong, they will continue to give arcades their share of problems.Home gaming companies, for instance, have no shame when it comes to ripping off arcades, Blais said. "If you were to purchase a new game like 'Need for Speed,' if it's popular, the next thing that happens is Playstation puts it on the market and you lose that," Blais said. "That's eroded the video game business. "Arcade games have also climbed in price and have much shorter shelf lives. A game Blais buys in winter for the coming summer usually ends up old news before the first snow thaw. Despite the obvious challenges, Cuthrell believes arcades still have a special place in the amusement market. "It does well even though a lot of people do have home systems," Cuthrell said. "There's something about the arcade that people love to come to. It's an atmosphere they can have fun in." LOS ANGELES: Video games are transforming technology, education and the US economy, a trade leader proclaimed yesterday at the world's largest computer games show. Entertainment Software Association president Doug Lowenstein backed his claim with a new study that concluded the multi-billion dollar industry was growing fast and stimulating innovation in areas ranging from medicine to anti-terrorism technology. "The video game industry is playing a pivotal role in shaping the economy of tomorrow," Lowenstein said at a Press conference at the Electronic Entertainment Expo (E3). "Clearly, this is an industry that is much more than just fun and games." The study, titled "Video Games: Serious Business for America's Economy," predicted that US video game software sales would reach $15 billion and the industry would support more than 250,000 high-skilled jobs by 2010. The US "millennial generation," people ages 10 to 30, will reach 75 million by that same year and "every one of those millennials will have grown up with video games as a central part of their DNA," Lowenstein said. "Video games are the rock-and-roll of the millennial generation," Lowenstein said. "And the 'Sims' and 'Halo' are the Rolling Stones and the Grateful Dead." The tendency for political and business leaders to trivialise and marginalise video game playing would likely wane as the generational divide narrowed, Lowenstein predicted. Efforts to improve game speeds, graphics and sounds has driven technology advances that have spilled into mobile telephones, PCs, medical and military gear, the studies concluded. E3, billed as the world's premier interactive entertainment event, is in its 12th year and some 400 companies have come to tout their software, electronics and accessories. Computer game titans Nintendo, Sony and Microsoft were among companies that converged on the Los Angeles Convention Centre for the event, which runs until tomorrow. Video Games Are an $18 Bln Industry? A new study finds video games have a bigger impact on the U.S. economy than previously estimated, accounting for perhaps $18 billion in 2004 alone. A new study commissioned by the Educational Software Association and developed by Robert Crandall and J. Gregory Sidak (PDF) suggests that the video game industry may have a much larger impact on the U.S. economy than previously thought: according to the researchers, video games may have contributed some $18 billion to the U.S. economy in 2004. The study argues that accounting for game sales (some $10.3 billion in 2004) isn't enough when measuring the overall impact of the industry: one must also consider salaries paid to game developers, corporate employees, and retail workers; the stimulative effect of video game technologies (such as improved graphics controllers) on other industries; and technological transfers from video games to other areas of the economy, such as medicine, corporate and military training, and education. Overall, the study recommends policymakers be aware of the video game industry's wider importance, rather than merely react in a knee-jerk fashion to moral objections that the industry is harmful to children and youth, both because of the dubious moral content of many games, but also for encouraging a sedentary lifestyle. An interesting take, considering Cradall is a Senior Fellow of Economic Studies at the Brookings Institution, and Sidak is a Visiting Professor of Law at the Georgetown University Law Center, both staunchly conservative organizations.